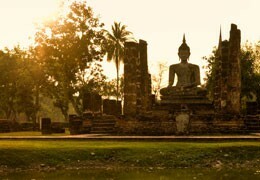 Isolated by the vagaries of the Mekong and largely bypassed by commercial tourism, Laos retains an other-worldly charm. 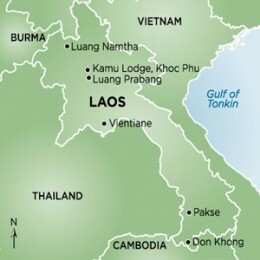 Laos is a small country, but remarkably diverse, both in its geography and ethnicity. There are hill tribes in the colourful southern part of the country where we see lush green rice fields and terraced tea and coffee plantations. There is a mystery to be explored with a visit to the Plain of Jars in the east where thousands of two thousand year old stone jars ranging in size for 70cm to 3 meters lie haphazardly across the site. Luang Prabang remains a favourite of ours for the chanting of the orange-clad monks and the multitude of temples. Nearby the limestone Pak Ou Caves are home to thousands of gold lacquered Buddha statues. And a little further up the Mekong lies a favourite eco lodge in the Lao jungle from where we can take primitive footpaths to remote villages.